Extreme close up view of woman’s face being covered with the organic beauty scrub mask. Facial therapy, modern cosmetology. Relaxation time, pampering, skin care. Skin recovery, rejuvenation. Extreme close up view of a beautiful female’s face with closed eyes being cleaned with steam therapy in beauty spa. Enjoying the spa, professional cosmetology tool. Being beautiful. 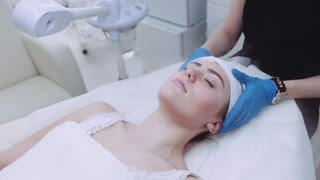 Professional beautician applies a white facial clay mask on female patient. Modern cabinet, cosmetic technologies. Modern woman, female activities. Hardware cosmetology, staying healthy. Extreme close up view of woman’s face completely covered with organic white beauty mask. Relaxation, joy of spa. Body care, skin care, pampering. Luxury cosmetics, facial therapy, modern salon. Close up view of a young female face being covered with an organic beauty mask by a professional cosmetologist. Skin care, facial therapy. Natural beauty. Extreme close up view of attractive woman’s face under the white cosmetic clay mask. Therapeutic procedures, modern cosmetology. Body care, skincare, pampering. Relaxation time. A beautiful female face covered with an organic beauty mask by a professional cosmetologist. Skin care, facial therapy. Natural beauty. Experienced specialist. Green alginate face mask. Cosmetology clinic customer, skin therapy. Woman with a mask on her face using her phone while doing cosmetic procedures cleaning mesotherapy of the face in cosmetology clinic.